Ooooh, I’ve been wanting to do something similar. Super cool! Me too! I don’t know why it took so long to get here. I had tried a couple of other half-assed solutions that sucked, but they led to this. I just didn’t like some of the other strap clips coming out…I don’t like my heavy DSLR hanging off of one side and exposed to the elements. I’d rather have it in a case that rests balanced with the overall load. This worked beautifully! Dave, I like the idea. Perhaps swap the carabiners out for some paracord braided up to attach the case to your s-biners. Would probably give you a little weight savings, still could be quick to attach/detach, give some extra cordage if needed, and also get rid of your clinky noise without having to ductape your carabiners. A good diy set up for sure! I had thought about that but I’m still no good with parachord projects. Besides, these binders weight next to nothing. The weight savings would be imperceptible. It could be a good project though. I’ve been using a large Tenba pack that has worked very well for day trips. Did a few modifications for more options on tripod hauling that worked well but still, all that gear is heavy. Even when I try to pare it down to the body, tripod, and one lens, by the time you add it water, food, and 1st aid… sheesh! I like your mods though. Gives me more ideas to noodle on. No two ways about it, Val. Carrying a DSLR and gear to use it us a hell of a load to carry. It’s just a matter of finding and easy, comfortable, balanced way to carry that allows easy access in the field. That’s an awful lot of gear just to carry your, umm.. gear! Carrying a DSLR and lenses is tricky, no two ways about it. I love the Capture camera mount system that clips right onto my backpack’s shoulder strap. It has quick release and can carry even a full-size DSLR even though I prefer a fourth-thirds GF2 for weight. Definitely worth checking out if you can pick just one lens and go with that, or live with having the other lenses in your main pack. If you want to be hands on with all your camera gear at any time then it’s much harder. What about a Ribz front pack? Enjoyed the write up, loved the biners and duct tape! I have looked at the Capture mount system (saw your review) but the two problems I have with it is that a) it sets all the weight to one side and I don’t like that, and b) the camera is exposed (to bushes, trees, cacti, rain, etc.) I needed something more protective of my gear. And though I do like to trim weight where I can, I don’t worry too much about it day hiking. 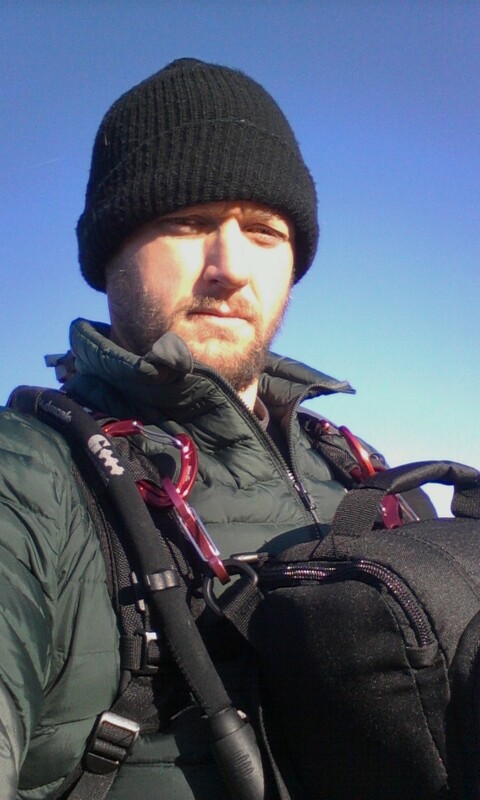 Besides, I’m still carrying a 5lb tripod…the added weight for the chest rig is only 8oz. I have thought about converting a RIBZ front pack into a camera carry. For a while I thought that might be my answer. If they want to send me one I’d be happy to explore that as an option. I would still need to add padding to the interior for the camera. ITW makes some non-metal carabiners that I like. I have a couple of their Grimloc locking d-rings. I like the quick release, and that they attach to webbing, and that they don’t set off metal detectors when I fly. Those would be good options too. I might have gone with the plastic carabiners if I didn’t already have UL biners here. I went with the plastic ones because I wanted one to easily attach to the straps. I was also going to uses it to modify our stroller to prevent the straps that held in the car seat from falling on the ground when they were unhooked. Instead the kid grew out of the car seat and it became moot. Amazing setup. I use kata 215 lighttri it has belt straps to go around torso.